A few months ago David and I met with Mark, our team leader, to discuss how our family was adjusting. One of the questions he asked was if there were any areas of life or ministry that were lacking in our lives here. One of the things I mentioned is how much I miss coaching. Mark told me that the GSF primary school would be putting together a team soon. The Ugandan school system is very different than in the USA. In Uganda, there is a free public school available through the equivalent of 7th grade, but the students are required to provide money for materials, transport and uniforms. For this reason, many children do not begin school at an early age. Some also help their families by working in the garden or caring for other children rather than attending school. In addition to that, you only progress to the next level if you pass the exams, even beginning in Pre-K. In the US most children begin Kindergarten around age 5 and graduate high school around age 18, but here in Uganda, ages vary much more. The primary school here at Good Shepherd's Fold has about 450 students from local villages up through P7, which is about our 7th grade. Students in P7 can range in age from 11 up through 16 or older. Because of this variety of ages in each grade level, sports competitions are based on age rather than grade level. For the past two weeks I have had the opportunity to work with the 14s and under and the 16s and under volleyball players at the GSF primary school. This is a very different coaching experience that my previous ones. First, we play outside in a field with lines faintly spray painted on the grass and rocks used as corner markers. (I chose to remove those for my practices.) I really enjoy being outside. The weather is usually great here, but we did get some afternoon rain showers to keep it interesting. 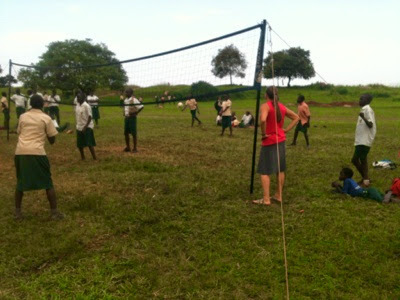 Here is a photo of me and my teams in front of our volleyball net. Secondly, I had around 20 players, and we had only one volleyball for practices. After the first week, I found a second ball to use which greatly improved the flow of practice. I have been to coaching clinics in the US where they recommend having at least one ball for every player. Drills function very differently when there is only one ball, so I have had to adapt my practice plan quite a bit. Thirdly, I don't even know the names of many of the players, and we have different primary languages. As they went around telling me their names on the first day, I realized that I had not ever heard many of these names before. If a word is completely new to me, it is much harder to remember and to associate with a particular individual. Of my 20+ players, I know the names of less than half of them. I finally do know the names of all the 86 kids who are currently living here at GSF, and now I am beginning to learn the names of these students. One great benefit of coaching in a foreign country is the opportunity to learn more of the local language. I have been keeping score in Luganda which has helped me to learn my numbers at least. While there are many differences between coaching here and in the USA, there is one important similarity. Coaching is another opportunity to glorify God and make disciples. Really that could be said about so many things, but I have enjoyed the opportunity to pray with and for these kids and talk to them about the love of God through Jesus. I am thankful for another opportunity to be a part of what God is doing in the lives of the students here, using the gifts and experiences he has given me. Where might he be calling you to make disciples?